We launched Mode Living at NY Now in 2015. When we received great feedback on our products, we realized we were onto something! Now, we are in our third year of business, and are in over 130 stores, as well as Bloomingdales, Neiman Marcus, and soon to be Frontgate. I truly love to entertain and bring people together through serving them a great meal. I love all the details that go along with the preparation: food selection, planning the menu, table setting, seating, etc. When I was having difficulty finding high quality linens that are also chic and easy to maintain, Verda came to my rescue and soon we realized that this was a big opportunity. You can see our full story here. All Mode Living linens have a special finishing that prevents wine or other liquid stains, while maintaining the luxurious and natural feel of the fabric. The only way to understand if the fabric is coated, is by dropping liquids on it. Our fabrics are Oeko-Tex certified, meaning they do not contain any harmful dyes or chemicals. We carry a wide variety of fabrics, sizes and price points, to dress almost any table! 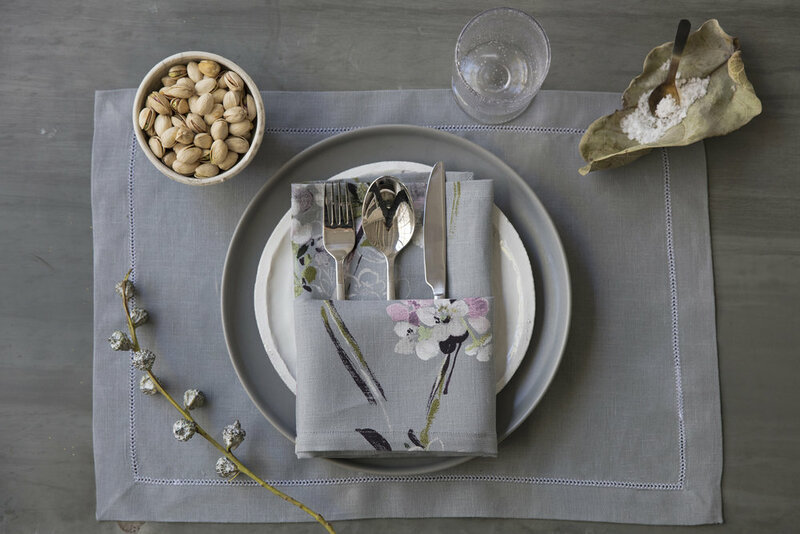 Our linens are versatile and can be used everyday or for special occasions, so there is definitely something for everyone and every home at Mode Living. We are in a niche space where there aren’t so many choices (that’s where it all started from! ), and people associate a tablecloth with being old-fashioned. The truth is, no one has spent time to modernize styles and patterns, or make them easycare! We keep our selection new and fresh by adding new products and styles that are in line with the season’s trends, and offer the best quality at the best price point. 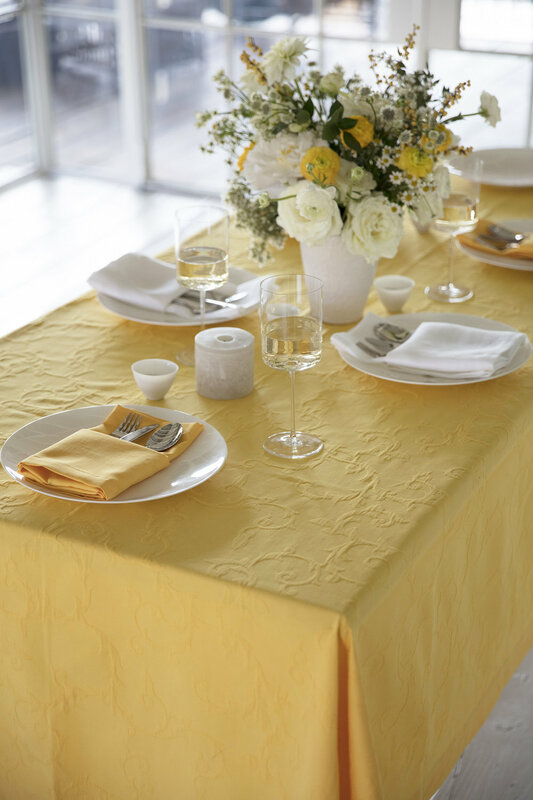 We are developing a good brand name as a result, and really getting known for the top quality table linens that are also easy to care for and versatile. We provide our clientele with something beautiful to dress their table with and easy to take care of, at accessible price point. Price points for a tablecloth vary from $75 to $320 (for our most popular size) depending fabric you select, so there is really something for every budget. I love working on our new collections and really enjoy meeting with customers. I look forward to seeing the same people every season, and feel like although it is only our third year in business, we have gotten to know some of our buyers quite well. I always love hearing their feedback and helping them select the right cloths for their customers. Being that I live uptown, it is definitely a tie between Genes Café on the 8th Floor of Barneys and Via Quadronno on 73rd btw 5th and Madison. Whether it’s for entertaining guests or a regular dinner at home, we make it easy for moms to set a pretty table without worrying about spills! We have lots of customers who are mothers, and they love the Essentials collection in particular for everyday use, as it goes “straight from the table to the washing machine, and from machine back to the table!” Our blends are unique in the market, as they are easy care with no plastic-y feel to them. I have met both Michael Aram and Michael Wainwright and give them tremendous credit for building beautiful and reputable brands and for being so welcoming in this industry. Buying high quality things that are low maintenance… and can be easily washed! I try to do this with my table linens, outfits, dinnerware… and the list goes on!